The post What to Do About a Collapsed Trachea in Dogs by Dr. Eric Barchas appeared first on Dogster. Copying over entire articles infringes on copyright laws. You may not be aware of it, but all of these articles were assigned, contracted and paid for, so they aren’t considered public domain. However, we appreciate that you like the article and would love it if you continued sharing just the first paragraph of an article, then linking out to the rest of the piece on Dogster.com. Recently my inbox has been inundated with questions from dog owners from around the world. That, in and of itself, is not unusual. However, lately I have noticed a marked uptick in questions about what to do about a collapsed trachea in dogs. First, what is a trachea? Small dogs like Chihuahuas are prone to collapsed tracheas. Photography by Netnapha Buaban/ Shutterstock. In medicine, every structure and condition has a fancy name. Freckles are called lentigo simplex. A mole is a nevus. A wart is a papilloma. Eyes with more than one color are said to exhibit heterochromia iridis. The word trachea refers to the windpipe. The windpipe, as you no doubt know, transmits air from the nose and mouth to the lungs. It sounds like a simple structure, but of course like everything in the body, it is more complex than it sounds. The windpipe is a tube made out of tissue membranes. Those of you who have studied physics know that when air moves, its pressure goes down. This reduction in pressure, called Bernoulli’s principle, can generate strong forces. It is what allows jumbo jets weighing over a million pounds to climb into the sky. When a dog breathes, air moves rapidly through the trachea, causing the pressure inside of it to go down. This creates a tendency for a collapsed trachea in dogs. Evolution solved this problem by adding firm structures, made of cartilage, to the trachea. A series of cartilaginous rings holds the trachea open when dogs breathe. So, what is a collapsed trachea in dogs and why do dogs’ tracheas collapse? Unfortunately for some dogs, humans have meddled with their evolution. The natural size for a dog is 40 to 50 pounds. When we created smaller breeds of dogs through inbreeding, we inadvertently created a tendency for them to have weak cartilage in their windpipe. A collapsed trachea in dogs, therefore, occurs almost exclusively in small dogs. Chihuahuas, Miniature and Teacup Poodles, and Yorkshire Terriers are especially predisposed to the condition. Most small dogs are born with cartilage that is sufficiently strong to hold the trachea open. However, age takes its toll on cartilage, as it does on so many things. As cartilage ages, it becomes weaker. Symptoms of a collapsed trachea in dogs thus occur most commonly in older dogs. What are the symptoms of a collapsed trachea in dogs? The first symptom of a collapsed trachea in dogs is usually coughing. As the windpipe narrows during breathing, dogs appear to feel a tickle in their throat. The symptoms of a collapsed trachea in dogs tend to be most prominent when air is moving faster and the forces leading to collapse of the structure are stronger. Therefore, the symptoms of a collapsed trachea in dogs are more likely to occur when dogs breathe harder. They often cough when they are excited or when they engage in strenuous exercise. The coughing caused by a collapsed trachea in dogs generally is dry and often sounds like a goose honking. The coughs may come in clusters, or they may be solitary. They may be triggered by pressure on the windpipe such as occurs when a dog who is leashed to a collar pulls hard. Vets sometimes can trigger coughing in dogs with the syndrome by gently stimulating the windpipe. The symptoms of a collapsed trachea in dogs can be identical to those of canine infectious respiratory disease, also known as CIRD, and known colloquially as kennel cough. In its early stages, the condition is sometimes mistaken for kennel cough (and the two conditions are not mutually exclusive). However, kennel cough is self limiting. Its symptoms generally resolve within a week. A collapsed trachea in dogs is a lifelong, progressive syndrome. How is a collapsed trachea in dogs diagnosed? A collapsed trachea in dogs can be diagnosed in two ways. Radiographs (X-rays) are the most common method. The trachea is visible on chest radiographs. The diagnosis is made if it is seen to narrow on the images. However, a collapsed trachea in dogs is a dynamic phenomenon. The windpipe narrows when the dog inhales, and then snaps back to its normal shape. If the image is acquired when air is not moving, the trachea will appear normal. A collapsed trachea in dogs can also be diagnosed with endoscopy. An endoscope is a medical instrument with a camera on its end. It can be inserted into the trachea, and the windpipe can be observed visually for evidence of collapse. What is the prognosis for a collapsed trachea in dogs? I am sorry to say that severe cases of a collapsed trachea in dogs can have fatal consequences. The narrowing of a collapsed trachea in dogs can become so severe that sufficient air cannot make it into the lungs, and affected dogs may die of respiratory distress. The news, however, is not all bad. Life-threatening cases of a collapsed trachea in dogs are rare in my experience. Most dogs with the condition experience coughing but do not progress to respiratory distress. How do you treat a collapsed trachea in dogs? Treatment for a collapsed trachea in dogs starts with basic lifestyle changes. 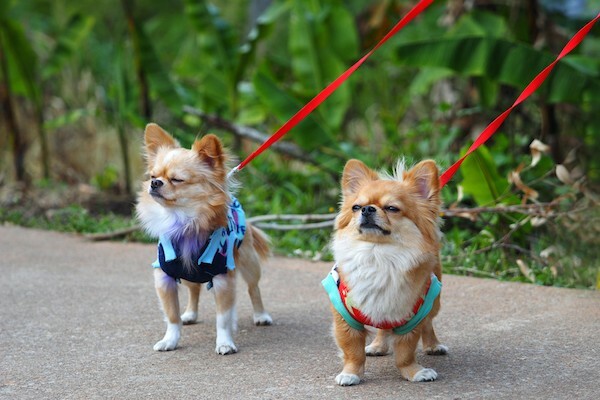 Leashes should be attached to harnesses rather than collars in order to avoid pressure on the windpipe. (In fact, I recommend harnesses for all dogs, not just small ones.) Obesity exacerbates the syndrome, so special attention should be paid to the weight of dogs with collapsing trachea. Dogs need to move more air through the trachea when they pant on hot days and when they exercise. Therefore, a collapsed trachea in dogs means that dogs should avoid strenuous activity during the heat of the day. Cough suppressants sometimes are prescribed to treat collapsed trachea in dogs. As the syndrome progresses, some dogs benefit from treatment with so-called bronchodilating medications, which open airways and facilitate breathing. Dogs with crises of respiratory distress due to collapsing trachea may be treated with sedation, supplemental oxygen, and steroids to reduce inflammation and swelling of the trachea. In severe cases, dogs may be anesthetized so that a breathing tube can be placed in order to provide ventilation. Is there a cure for a collapsed trachea in dogs? What can you do about it? There is no cure for a collapsed trachea in dogs, but dogs who suffer from advanced forms of the condition sometimes benefit from a procedure called tracheal stenting. Tracheal stenting involves permanent placement of a rigid structure inside (or in some cases, outside) of the windpipe to hold it open. I recommend that owners of small dogs who frequently cough discuss collapsing trachea with their veterinarians. A good vet should be able to help come up with a comprehensive treatment plan to keep dogs breathing well. Thumbnail: Photography by Ezzolo / Shutterstock. What Is GDV in Dogs and Why Must Dogs With Signs of GDV See a Vet?